Yep, a fond farewell to a few of my stalwart kitchen appliances. For over thirteen years, I have baked, sautéed, fried, reheated, chilled, and frozen with my oven range, my microwave, and my refrigerator. They have been good friends, but their age is showing and it is time for us to say our good-byes. (Well, the refrigerator is just being moved to the garage for more refrigerator space). On Monday, we are switching a few things around in our galley kitchen to make space for a new range (five burners and a double oven-- yes! ), a convection microwave (for a total of three ovens--yes, yes! ), and a french-door refrigerator with the freezer on the bottom (it's a beauty!). So, to bid my gas and electrical friends a farewell, I am making some of my favorite components to our Sunday dinners for one last go around. I am baking a fresh loaf of white bread for the melba toasts and croutons. I am roasting potatoes and a chicken with bacon (o.k. two, one is for leftovers). 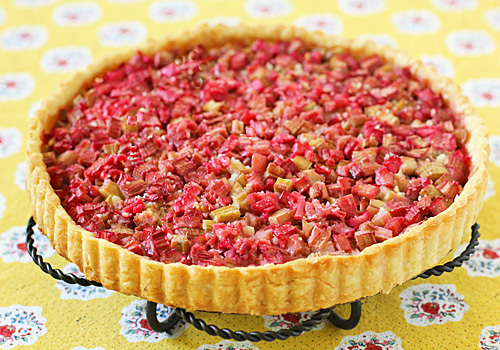 Lastly, I have baked a tart using fresh rhubarb from my garden and that is the recipe that I am sharing today. This tart is perfectly simple. No frills, no fuss, just rhubarb. The crust is partially baked and then a mixture of almonds and sugar is scattered over the bottom. The rhubarb is piled on top and dotted with a bit of butter. Sliced and served with whipped crème fraîche, whipped cream, or even a little ice cream for a really good pairing, this one is classic art of the tart. In the bowl of a food processor, combine the flour, salt and butter. Process for 10 seconds, then add 2 -3 tablespoons water. Process for another 10 seconds or until the mixture looks like cornmeal. Dump the mixture on a table or counter and bind a small amount at a time with the heel of your hand, using a sliding motion to incorporate the butter and flour smoothly. Gather the dough into a ball and flatten it. Wrap in plastic and refrigerate for 15 minutes, just long enough to firm up the butter. Lightly flour a work surface and rolling pin. Roll out the dough to a 13-inch circle, making sure there is flour under the dough and on the rolling pin to prevent the dough from sticking. Line a 10-inch tart pan with the dough, fitting the dough into the edge of the pan. Roll the rolling pin over the top of the tart pan to trim the excess. Place the tart pan on a baking sheet and refrigerate the unbaked tart shell for 2 hours or freeze it until ready to bake. Preheat the oven to 400˚F. Line the tart shell with parchment paper or aluminum foil and fill it with pie weights or dried beans. Place the tart shell in the middle of the oven and bake for 15 minutes. Remove the beans and foil. Bake 5 to 10 minutes to dry out the bottom without coloring. Set on a rack to cool completely before filling. Preheat the oven to 425˚F. Combine the chopped almonds with 1/3 cup sugar and spread on the partially prebaked tart shell. Pile the rhubarb on top of the almond and sugar mixture. Sprinkle the remaining sugar on the rhubarb and scatter shavings of butter on top. Bake the tart on the baking sheet until the crust is golden and the rhubarb has shrunk, about 30 minutes. Transfer the tart to a baking rack to cool completely. Serve with whipped crème fraîche, whipped cream, or ice cream. Enjoy! Aw shucks, I just used up my rhubarb making Rhubarb Ginger Muffins (they were quite delicious but nowhere near as pretty as this tart). 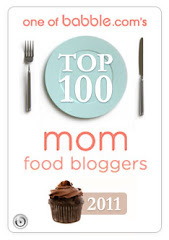 Maybe I'll pick up some more and try this recipe. It looks just gorgeous. rhubarb tart looks so good!